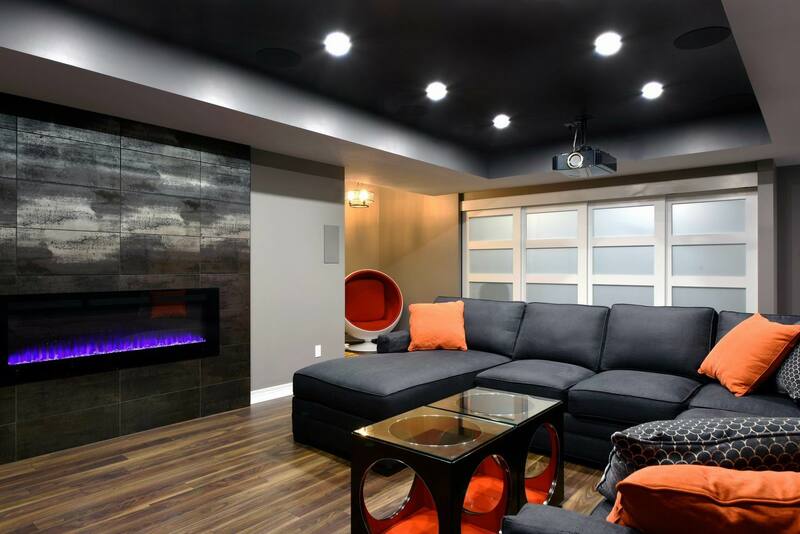 An unfinished lower level offered a perfect blank canvas to help a family create an awesome basement renovation that has everything on their wish list, including a space for their beloved turtles. There’s a movie theatre, home gym, hidden sewing station and plenty of room to relax — with clever ways to tuck things away when not in use. 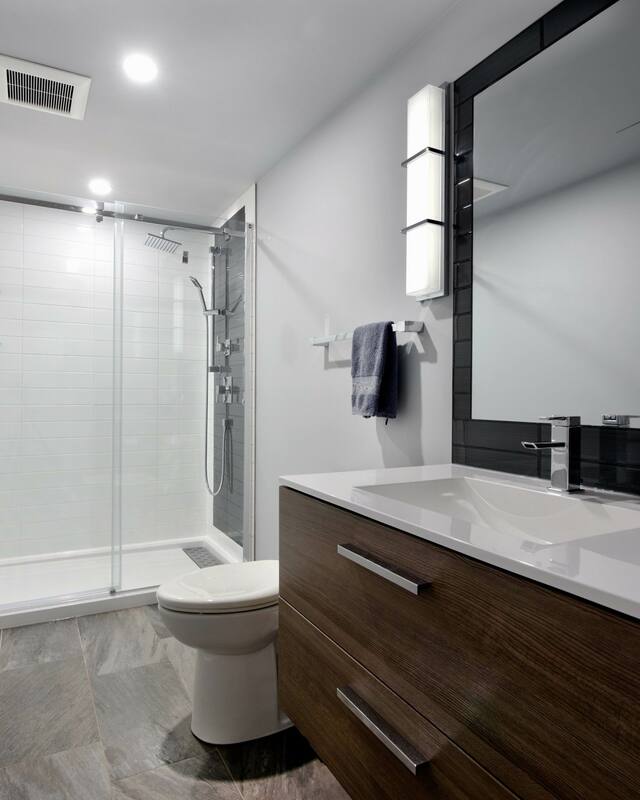 Our efforts have resulted in this project being nominated for the Basement Renovation award at the upcoming Housing Design Awards of the Greater Ottawa Home Builders’ Association. While this lower level needed to have certain functions, pulling it together in a way that was fun, efficient and clever was key for Designer Greg Simpson. He used the existing palette upstairs as his guide, to ensure a seamless transition between the main floor and basement. 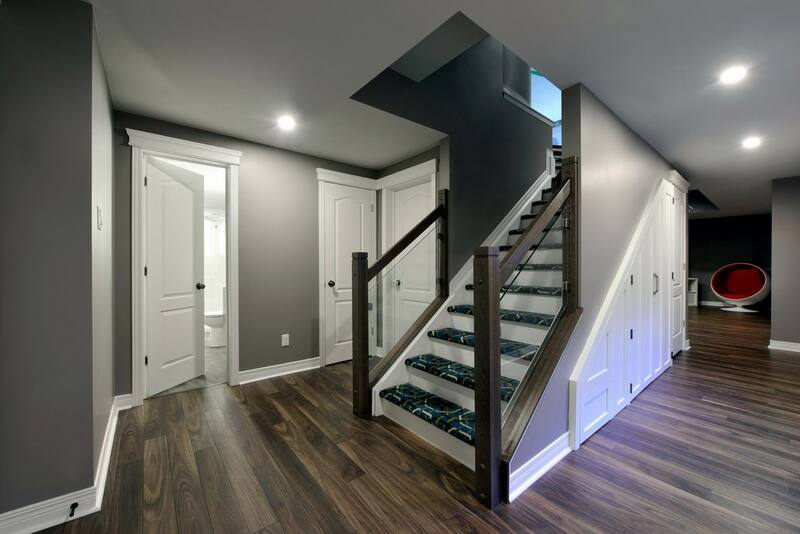 Large baseboards and matching door trim were painted in bright white to define the warm grey wall colour, while a colourful carpet on the stairs is an eye-catching detail that gives a visual cue to the transition between levels. Meanwhile, the stair walls were taken down and railings were installed to open up the entrance to the basement. The homeowners’ two turtles are a big part of their home, but the turtle tank was relegated to an empty nook in the middle of the unfinished basement. Since the turtles are there to stay for many years, the tank was built into the wall with access in the back through the storage room. The gym, which is located at the back of the home theatre area, has sliding doors so the homeowners can watch TV while working out. Connecting this space to the home theatre is a tiled wall at one end of the gym that matches the fireplace surround. The gym can be seamlessly closed off when having guests thanks to sliding white doors with frosted glass. The turtle tank and sliding doors were worked within the existing structure to minimize bulkheads. 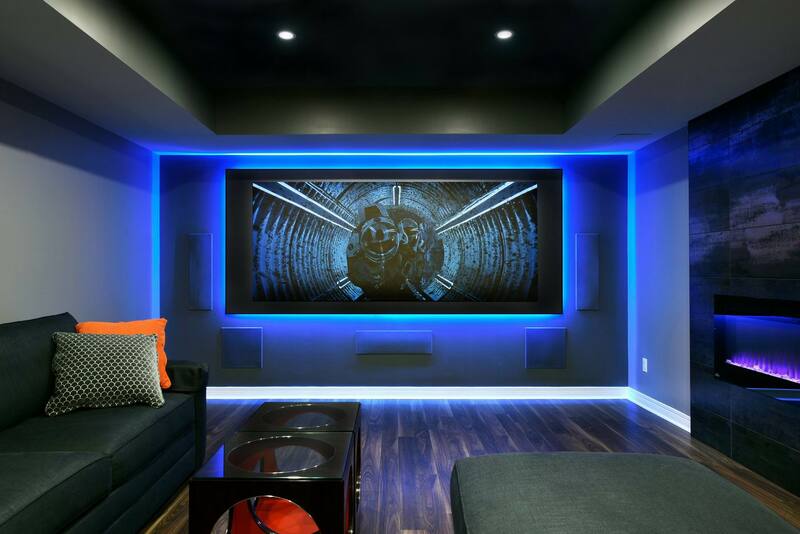 The home theatre is in its own section of the basement, with the screen occupying the largest wall space as the focal point. There is plenty of room to circulate and a large L-shaped sectional fits perfectly in the space to provide a comfortable place to sit and watch hours of film or television. The fireplace is centred on the wall to define the theatre area from the play area (the nook to the right of the fireplace). Thanks to the high ceilings in this basement, we were able to relocate duct work to build the tray ceiling, which adds character and offers a convenient and stylish spot for the pot lights and projector. The pot lights can be dimmed to provide any amount of desired light. All lights, the audio/visual system, and the fireplace can be adjusted by one controller. The theatre room was soundproofed and includes a state-of-the-art A/V system. The TV wall was framed to accommodate the built-in speakers (which match the wall colour for a seamless look) and the lighting surrounding the TV so that no wires or equipment would be seen. LED lights around the 144-inch rigid screen can be changed to any colour to suit whatever is being watched. 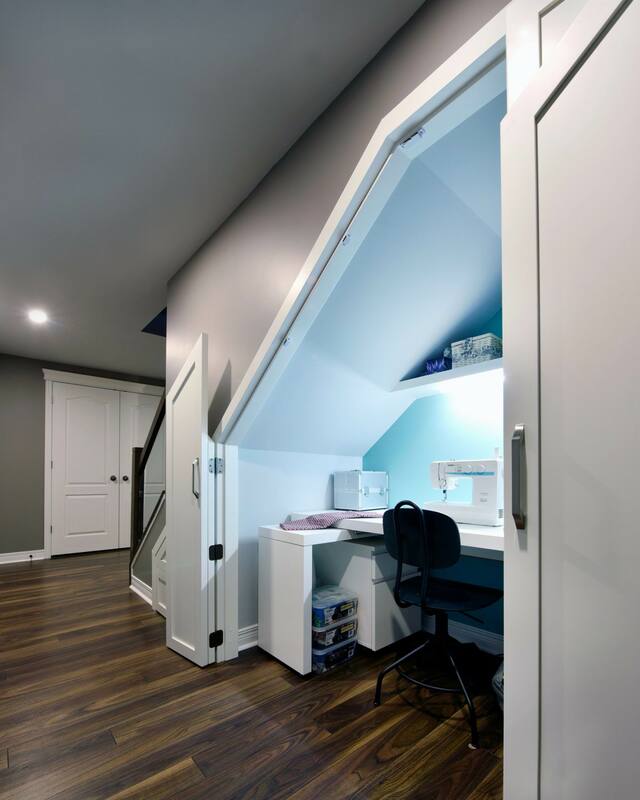 A sewing nook and an A/V closet were built under the stairs to utilize all available space. Both are hidden behind custom doors. Also hidden is a bright laundry room, which is behind the doors at the bottom of the stairs. While much of the basement space is about entertaining and family living, there is also a large bedroom and a bright three-piece bathroom that includes lots of storage with creative cabinet accessories.